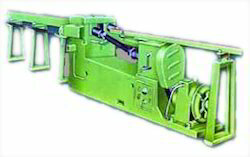 Manufacturer & Exporter of Bar Straightening Machines. Our product range also comprises of Round Bar Straightening Machine, Planing Machines and Plano Millers. We are successfully ranked amongst well-known company in offering Bar Straightening Machine. These machines are fabricated using optimum quality raw material under the supervision of our experienced professionals. We offer Bar Straightening Machine to our clients with following specification. Looking for Bar Straightening Machines ?